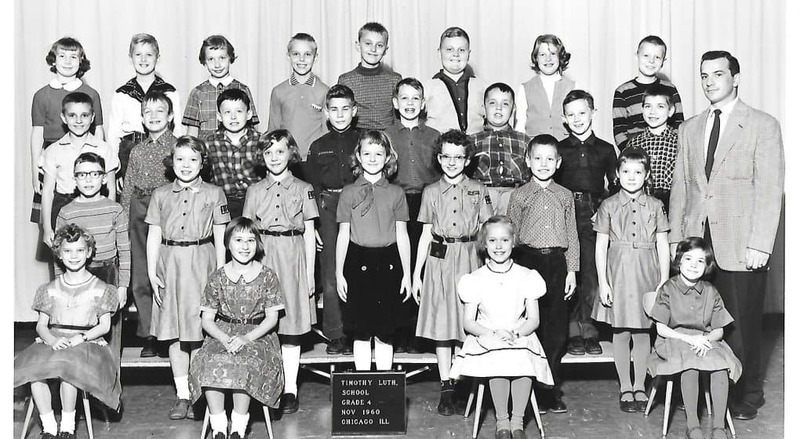 Mr. Lutz’s fourth grade class at Timothy Lutheran School – November, 1960. I’m on the bottom riser, far left, with striped shirt and glasses. 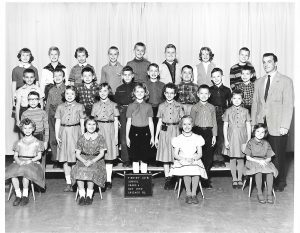 I entered fourth grade at Timothy Lutheran School (Chicago, IL) in September of 1960, transferring from the Evergreen Park public school system. Although my parents faithfully attended church every Sunday, they sensed God nudging them to provide a Christian day school education for their only child. So began a series of daily encounters with Jesus that spanned fourth grade through my graduation from Concordia, River Forest. Most noteworthy, specific Jesus moments at Timothy stand out. I remember my excitement the day I purchased my first Bible (KJV, of course) at Timothy’s school bookstore. As an eighth-grader, I wore my black suit to usher at weekly school chapel services. Because our classroom didn’t have a piano, Mr. Trautsch led acapella singing of hymns paired with our daily classroom devotion. Finally, Mr. Lutz’s compassion for a tearful, lonely me resonated throughout my teaching ministry.